A shortage of skilled laborers is a rising issue in Central Florida construction that seems to plague many job sites. This labor shortage –which is a national epidemic– can make getting quality results in a timely manner more difficult than ever. But, there are several things that we do at McCree which enable us to continue getting quality results for our customers, even in the midst of a labor shortage. First and foremost, we hire the best people and pay them what they’re worth. In the construction industry, as in any other industry, when you want something great you have to be willing to pay for it. High-quality, dependable laborers need to be compensated for their time and the level expertise they bring to each project. And, investing inexperienced and talented laborers is well worth the cost because it gives you peace of mind that your project will be completed successfully and in a timely manner. We always prioritize quality workmanship. One of our specialties at McCree is building relationships. In our many decades in this business, we have learned that loyalty and treating people with kindness are essential to building strong partnerships. The teams that we work with know that they can depend on regular work from us and therefore they are more likely to prioritize our projects over someone else’s. This is a huge advantage for us when skilled labor is hard to come by. Everyone wants to come to work and feel good about a job well done. Treating people with respect goes a long way in the construction business and is an excellent way to build loyalty with talented laborers who could easily find work elsewhere. McCree does more than treat our employees with respect. In addition, we engage with the community at local, state and national levels to help alleviate the labor shortage. McCree participates and is active in organizations whose sole purpose is to help train and procure the future generation of skilled talent. These organizations include Associated Builders & Contractors, IbuildCentralFlorida, Academy of Construction Technology, and many others. 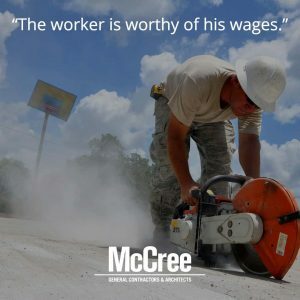 McCree feels a sense of responsibility to do our part to help this epidemic and encourage people to have a career in the Architecture, Engineering and Construction industries. Since 1926 when the first McCree buildings were being erected in Central Florida, we’ve continued to operate as a family business. Our goal is that our teams feel like extended members of our family. In the midst of a labor shortage, we always continue to get quality results for our clients because our teams believe in us as we believe in them. Our mission is to build exceptional places where businesses can thrive, and that commitment begins at home by building an excellent company which attracts excellence. For more information about McCree’s commitment to quality, building relationships, and operating as a family business with a commitment to families, contact us today.